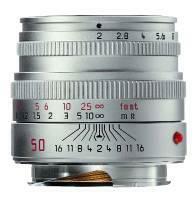 Prices are the approximate amount one should expect to pay for a Leica-M lens in excellent, but used, condition. Glass and body should be clean and without scratches or cleaning marks. Hoods, boxes, caps and finer condition will all add to price. Leica lenses can and do vary widely in price depending on exact condition, serial # and pedigree. Pricing was gathered from sales on photo.net, RFF, ebay auctions, Tamarkin auctions, the LUG, and other camera dealers. Prices are biased towards completed ebay auctions and private sales on photo.net and RFF. Expect to pay 15 to 20% more directly from a dealer. 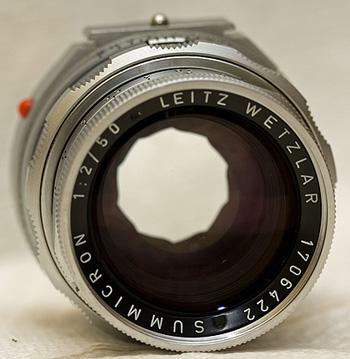 28 Elmarit F2.8 Type 3 $ 650-950 2,977,551- ? 28-35-50 Tri-Elmar F4 E49 $ 1,500-1,800 Many non-optical improvements. 50 Elmar F2.8 Type 2 $ 650-1,100 2,700,000 - Current. Late black get more. 50 Summicron F2 Type 4 $ 1,400-1,975 2,967,000- ? 50 Noctilux F1 Type 3 $ 6,400-7,100 3,220,709 - Current. 135 Tele-Elmar F4 Type 1 (E39) $ 350-500 2,077,000 - ?